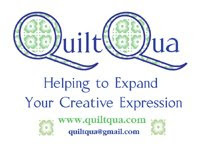 Patsy Thompson is an amazing free motion Quilt Artist, Pattern Designer and now she has her own line of Machine Embroidery and Pre-Cut Applique shapes. I count my self incredibly fortunate to call her a friend and enjoy every opportunity I get to talk about her work and designs. One of Patsy's stunning quilts that includes her Pre-Cut Shapes, Machine Embroidery and her gorgeous free motion quilting. I hope you decide to hop along with us and are inspired by our projects. Please share the information about this hop with all of your friends and readers....we would love that! Ohhhh she does fabulous work!!! Patsy just came to our guild this month. Her quilts were awesome to see in person.